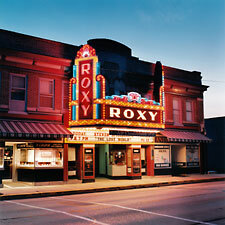 During Hollywood's golden age -- the 1920s through 1940s -- nearly every American city and town had its own movie palace. Whether an extravagant, neon-clad jewel or of more modest proportion, the neighborhood theater was the anchor of the community's social and economic life. Designed in a wide range of flamboyant architectural styles, America's historic theaters have entertained millions, first as vaudeville houses and later as movie theaters. These lavish theaters offered moviegoers an escape from hard times into a world of illusion during the Depression. But as the post-World War II boom fed migration to sprawling suburbs, many downtown palaces fell into disrepair or closed. Multiplexes later presented stiff competition for single-screen theaters by offering a choice of films at one convenient location. 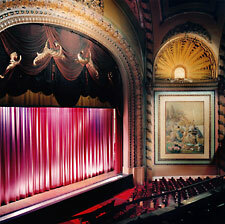 The downtown theater, with only one auditorium and screen, could no longer compete. Some of these architectural treasures have been saved, finding new life as performing-arts centers, but most have been lost forever. These early theaters represent a unique architectural resource that is rapidly vanishing from the nation's landscape. In fact, in 2001, the National Trust for Historic Preservation placed the single-screen historic theater atop its Most Endangered Historic Places list. The drive-in has suffered the same fate as the single-screen theater. Before World War II the drive-in was a modest trend, but after the war the craze began in earnest, peaking in popularity in the late 1950s and early 1960s. Drive-ins were ideal for the modern family: everyone jumped into the car, no babysitter needed. "Car culture" had officially arrived as a dominant force on the American scene. Over time, changing real estate values began to have an effect on the drive-in. Land became too valuable for a summer-only business. Widespread adoption of Daylight Saving Time in the mid-1960s subtracted an hour from outdoor evening screening time. The decline was further hastened by the advent of VCRs and home video rentals. In the 1950s there were over 4,000 drive-ins nationwide. Today there are fewer than 400. From the ornate city palace to the intimate small-town movie house, my photographic journey has taken me all over the country. I strive to record this rapidly vanishing era in American popular culture. Through this series I explore the history of architecture and design, the evolution of our social history and habits, and the importance of preserving a record of the past.